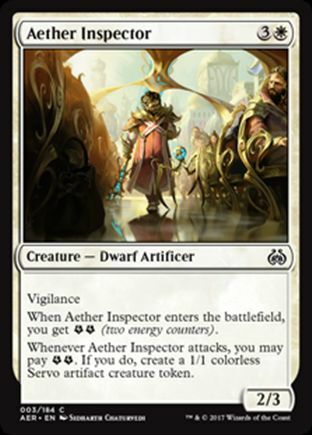 * Dit is het aanbod van Aether Inspector uit Aether Revolt. Als een kaart in meerdere series zit kun je die apart aanklikken hierboven. Klik op de getallen om direct naar iemands collectie te gaan. De leden die het meest recent zijn ingelogd staan bovenaan. Leden die meer dan 14 dagen niet zijn ingelogd worden niet vermeld. When Aether Inspector enters the battlefield, you get EE (two energy counters). Whenever Aether Inspector attacks, you may pay EE. If you do, create a 1/1 colorless Servo artifact creature token. E is the energy symbol. It represents one energy counter. If an effect says you get one or more E, you get that many energy counters. To pay one or more E, you lose that many energy counters. Any effects that interact with counters a player gets, has, or loses can interact with energy counters. Energy counters aren’t mana. They don’t go away as steps, phases, and turns end, and effects that add mana “of any type” to your mana pool can’t give you energy counters. You can’t pay more energy counters than you have. Some triggered abilities state that you “may pay” a certain amount of E. You can’t pay that amount multiple times to multiply the effect. You simply choose whether or not to pay that amount of E as the ability resolves, and no player may take actions to try to stop the ability’s effect after you make your choice. Aether Inspector is in te weinig decks gevonden.